Just as an upfront disclaimer, I have not seen the movie that this book is based on. I'm told that it deviates quite a bit from the book. I was also told, while in the middle of reading this, that the cover art makes it look more sappy than it is. I think the cover art of the movie poster doesn't really explain the book very well at all! But this is the copy that I borrowed from the library so it's the one I'm picturing and talking about it because it definitely played a role in shaping my impression of the book. At any rate, I sat down with a Coke Zero (to be specific) and started to read The Painted Veil and wondered exactly what kind of bookclub it is that I'm involved with! I'm going to have to offer spoilers here to some extent or another (but I won't reveal the end, which is something of a horrific surprise.) It opens with the main character, Kitty Fane, who is the most flippant, shallow female you could ever hope to not meet. She married a man she thought boring simply to please to her mother, although she did not love him. Instantly we discover that she is involved in an illicit affair - which thankfully Maugham is not too descriptive about. You get the idea though and right quick! I only made it about eight chapters in (they are short chapters) when I wanted to burn the book. I was quite incensed and I hated Kitty with a passion. Quickly I made the decision to stop reading it. I moved on with my life. For about half an hour. Without my consent, Maugham's writing was drawing me back in and so I (ever so) cautiously picked it back up again and continued on. The affair is discovered by Kitty's husband, Walter. Walter is deeply wounded, as any husband would be. He gives Kitty two choices: he will either divorce her or she can come with him to a small village in China where there is a cholera epidemic. To go with him is almost certain death. To not go is certain shame. 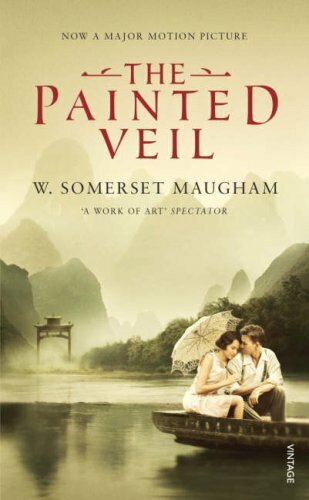 The Painted Veil is all about the theme of love and learning to forgive. W. Somerset described Kitty perfectly. She is childish, stupid and thoroughly heartless. She is the type that "follows their heart" even though it's leading them (and others) down a path of death and destruction. It isn't until she hits rock bottom that she realizes the mistakes she has made. I can't explain much more without thoroughly spoiling the story but, suffice it to say, I ended up thoroughly enjoying the read . . . while hating it at the same time. This book provided a very lively debate at bookclub over whether or not Kitty was entirely to blame for the affair or if some blame could be doled out to Walter as well. The group's opinions seemed split down the middle (I think there was a bit of misunderstanding in hashing out this particular point, actually) but for my part I think that Kitty is entirely responsible for her own sin of adultery. Whatever Walter is or is not, he did not make the choice to sin in his relationship to Kitty. I found him to be honorable and respectable in all of his actions to her. The book is told through the eyes of Kitty and so, again in my opinion, her actions alone can be debated and judged. I liked this choice for bookclub because it (rather surprisingly perhaps) sparked interesting conversations as to what the Christian man or woman is called to when they commit to marriage. It gave us all a lot to think about and I walked away encouraged by the older married women as to what my calling is towards Jonathan in this life we are living together. On the whole I found The Painted Veil to be a fascinating book to read and think about. When all is said and done, I'd have to recommend it - with the caveat that it is primarily involved with the subject of an affair and how it affected individuals and a marriage which some might find particularly disturbing. It certainly makes for a difficult topic, as well as a thought-provoking one. I had never heard of this: I don't think I have read anything of Maugham's. Interesting! It's not something I am inclined to pick up any time soon, but maybe some day. I LOVE Maugham and I love reading your blog! It always makes my morning a better place. Which is saying something because my mornings are usually quite lovely. As for the discussion, me and the other recalcitrant woman (heh) were talking things over at the Book Bin yesterday and we think the words we were using were wrong. I think "blame" and "fault" were both used by us and shouldn't have been used. So, you are right...misunderstanding abounded. Don't you always think of the correct way to phrase things AFTER the conversation? Or at least, I always do. I agree that Kitty was totally to blame and totally at fault. Whatever one's conclusion about "fault" for the breakup of the marriage, the key point in my opinion is that the damage was done before the marriage began. Kitty chose to use marriage and her husband for her own ends. Her husband deserved to marry a wife who actually loved and desired him. It is doubtful he would have married had she been truthful about her lack of love and the fact she was marrying to get what she wanted. She never intended to give anything of herself to him. In my experience through the years as an attorney who represents in divorce cases, this is one of the biggest factors in divorces: one or both partners enter the marriage with absolutely no intent to give to the other. And usually, it is the woman. Interesting. Loved and hated and yet still recommend? Hmmm... Now I'm intrigued. I read the reviews and such on amazon and would have guessed you would not have liked nor recommended. Shows what I know! :) Of course, I haven't read it so I really do know nothing--ha! Shonya - I actually compared her to Scarlett at bookclub. I thought that exact thing! You can't help but read it but MY. WORD! Stephanie - Well, it definitely stretches me. Three Cups of Tea!? THIS!?! What on earth...!? I'd highly recommend the movie. I really loved the movie. It is very different and I won't give details but it was one of the few times I enjoyed the movie more than the book. And not just enjoyed, but thought it was a better story. It's also a really gorgeous and well-acted movie.